Y’all! We made it to Friday, and I couldn’t be happier! The weather is nice. The house is clean. Work has been all caught up on. But most important, weekends are for taking things a bit slower than the normal every day. Coffee gets sipped from a big ole mug instead of a to-go tumbler. Bubble baths get taken instead of a quick shower. Books get read for leisure. Longer walks get taken with the dog. Family games get played and laughed over. And baking… baking all the things! Weekends are for sleeping in. 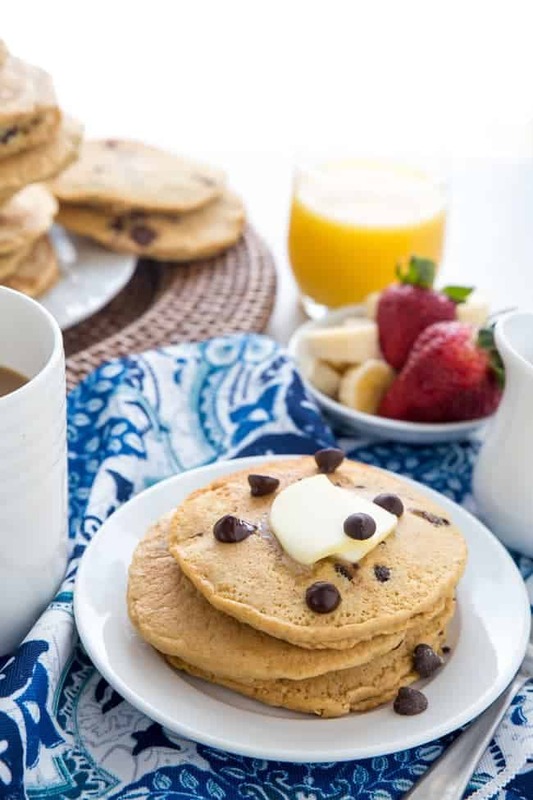 Weekends are for breakfast together as a family… even though our Sunday breakfast usually doesn’t happen until like noon… seriously, we do weekends SLOWLY! But we’re always sure to enjoy each and every bit of it… and each BITE! 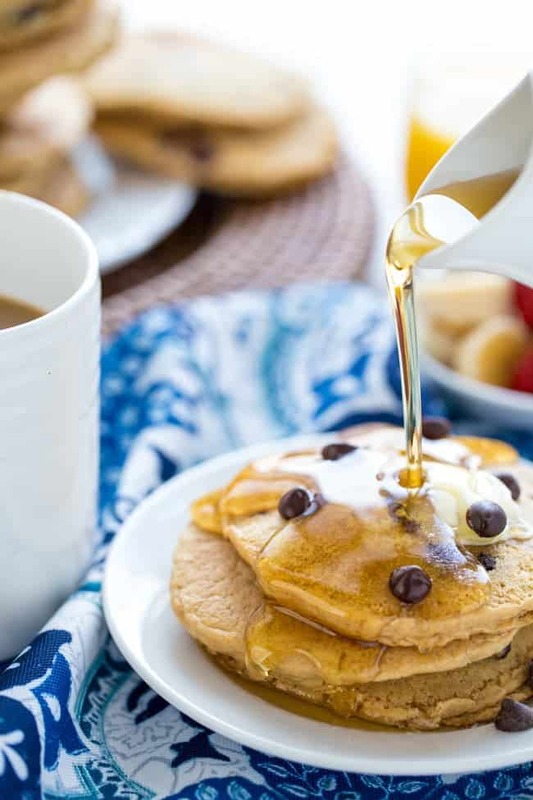 I mean, really, is there anything better than a chocolate chip pancake topped with a bit of butter and a drizzling of syrup? 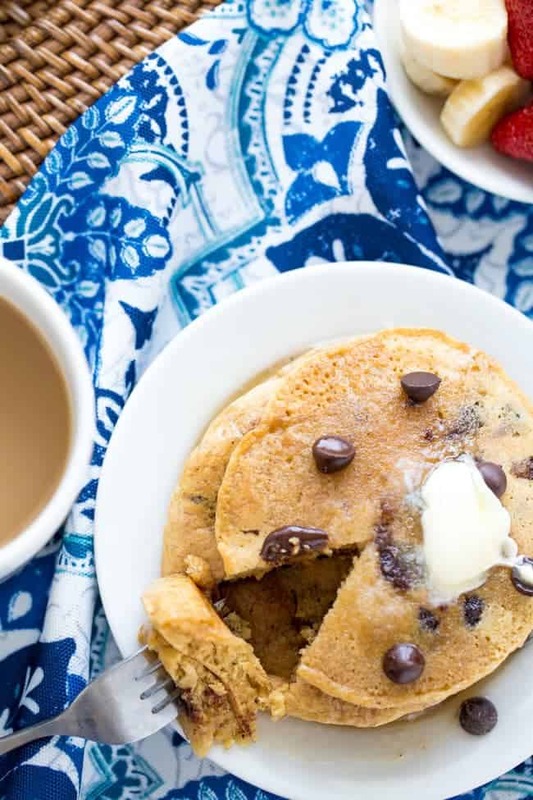 Chocolate chip pancakes make you go to your childhood. All you really need at this point is a little whipped cream and banana slices to turn it into a funny face stack, right? 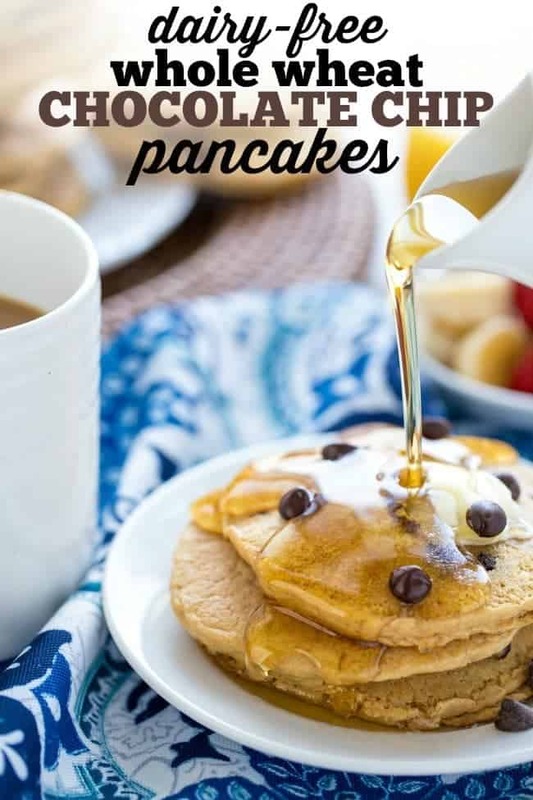 That’s the best part about these pancakes. They’re nummy enough to please your kiddos, but they’re healthy enough to please mom’s tastebuds and health desires. Whole wheat. 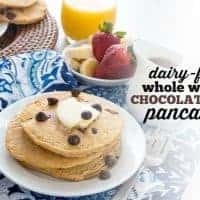 Dairy free with the help of my favorite Enjoy Life chocolate chips. Egg free. But NOT flavor free by any means! 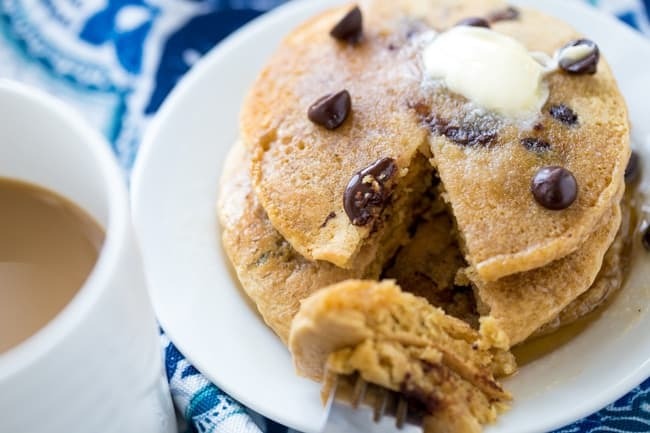 Get your weekend on with a stack of these Dairy-Free Whole Wheat Chocolate Chip Pancakes. 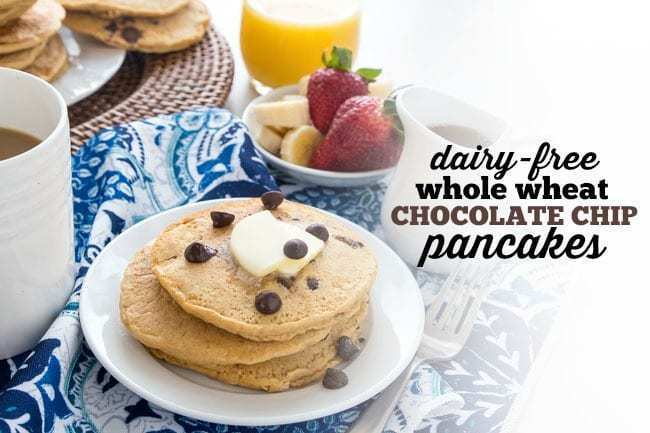 Your weekend pancakes have been healthified, have no dairy or eggs, but are totally dessert-like! Pour the milk, yogurt, oil, and vanilla in a separate small bowl and whisk until completely combined. Pour liquid mixture into the dry mix and stir with a fork until just mixed and no more flour is seen. Stir in chocolate chips. 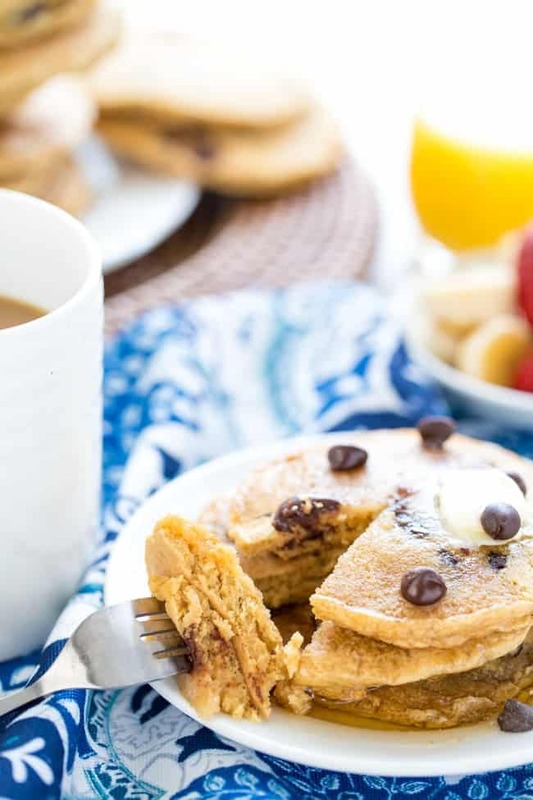 Chocolate chip pancakes were my favorite growing up- and I still love them! These look super dense! 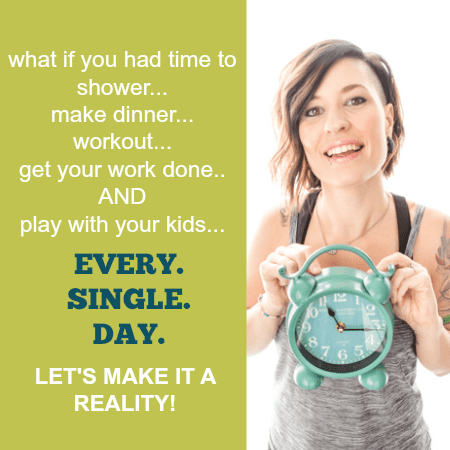 Yes even as adults, we should get to enjoy the flavors of our childhood – and with these being healthy, you totally can!